Trail shoes are designed for off road experiences. They have tread for gripping uneven and soft terrain; uppers which are water-resistant and tough enough to withstand the rocks, sticks and brush you'll bump and scrape against; and often have a rock shield in the forefoot to help prevent bruises when stepping on stones and roots. 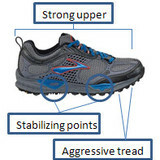 Trail shoes will be more stable than a road shoe when treading across the inconsistent surfaces of grass and trails. Their dark colors keep them looking nice even when used on the muddiest paths. There are both neutral and support trail shoes.